We have mastered the art of manufacturing and supplying an exclusive range of Metal Gate. Our products are made with best grade material. Our company takes pride in announcing ourselves as the leading provider of Stainless Steel Gate. Offered range is excellent in appearance and finishing thus adds class to the place it is installed. Our experts design the range in highly unique patterns making it look highly impeccable. Stainless Steel Gate is dimensionally accurate and does not corrode. We are manufacturers of SS Lighting Gates we assure high quality and great standards in our product. We are one experts in the market who offer this product at great price. 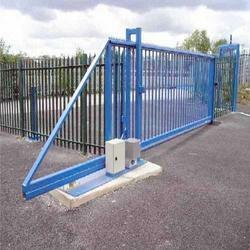 With a motto to maintain long term relations with the clients we offer Cantilever Gate. The range is designed using very high quality metal that is highly strong and is resistant to corrosion. The product is easy to install and have long life span. 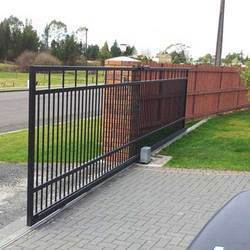 Cantilever Gate is flawless in finish and has commendable sturdiness. 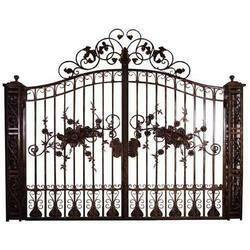 Owing to rich experience and knowledge, we offer our esteemed clients a range Mild Steel Gate. This product is marked with excellent finish and great strength. The range is usually finds application in homes and farmhouse to provide utmost security and also to add grace to the beauty of the place. Mild Steel Gate requires very less maintenance. 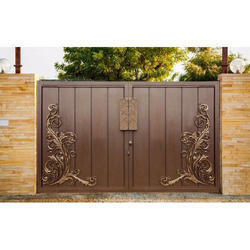 We have carved a distinct position as the leading provider of Sliding Gate. Premium quality metal is used in the designing of the product ensuring long life, utmost strength, and resistance to rusting and very attractive appearance. Sliding Gate is light in weight thus making it easy to slide with smooth flow. The installation of this range is highly simple. ornamental gateOur company, Fab Tech is the renowned company which is involved in the manufacturingand supplying to our esteem customers. Our company was incepted in the year 2015 as a Sole Proprietorship (Individual) based company at Chennai, Tamil Nadu, India. Our offered range of services include Metal Gate, Metal Staircase, Window Grill, Safety Door Grill and many more. Moreover, we are also providing Fabrication Work. Our company assure our valuable customers that the quality of our products run as deep as the establishment of our companies. We provide the good and vast range of quality products with industrial norms and standards, service guarantee with customer satisfaction. We are using the latest technologies in design and manufacturing steel gate, grill and trolley. We understand our client’s requirement so our structures are designed according to the customer’s needs with a specific time frame. Further, our products are offered at affordable prices according to the customer needs. Wooden Gate With Laser Cutting DesignOur company, Fab Tech is the renowned company which is involved in the manufacturing and supplying to our esteem customers. Our company was incepted in the year 2015 as a Sole Proprietorship (Individual) based company at Chennai, Tamil Nadu, India. Our offered range of services include Metal Gate, Metal Staircase, Window Grill, Safety Door Grill and many more. Moreover, we are also providing Fabrication Work. Our company assure our valuable customers that the quality of our products run as deep as the establishment of our companies. We provide the good and vast range of quality products with industrial norms and standards, service guarantee with customer satisfaction. We are using the latest technologies in design and manufacturing steel gate, grill and trolley. We understand our client’s requirement so our structures are designed according to the customer’s needs with a specific time frame. Further, our products are offered at affordable prices according to the customer needs. With a motto to earn huge clientele, we offer our clients with Shed Fabrication. Experts undertake the task with close observation on the quality raw material used. The services offered by us are timely and highly effective. Various designer types of shed are designed by us as per the requirements of the clients as per their preferences.